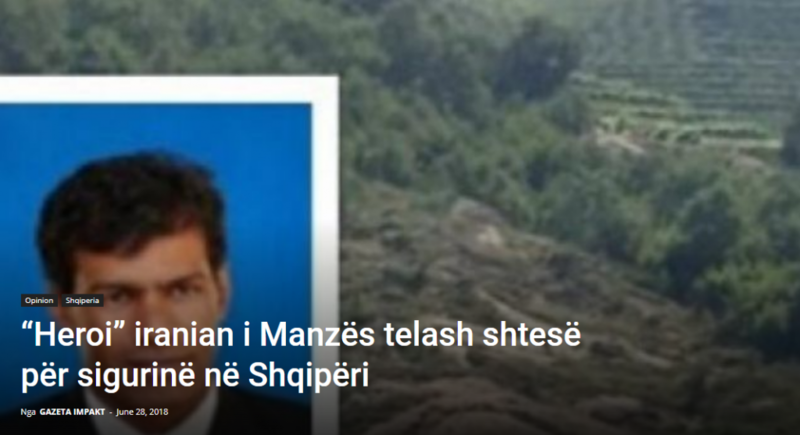 On June 19, 2018 Albanian police were officially informed by the Iranian Mojahedin (MEK), stationed at Camp Ashraf 3 in the Administrative Department of Manez, that a 47-year-old Mojahed named Malek Sharai was drowned in the Rrotull village reservoir. According to the 4 Iranian Mojahedin who were with Malek, he jumped into the reservoir to help a friend of his who was at risk of drowning. Fortunately, the friend had escaped, but Malek was drowned in the irrigation channel. Albanian police sent divers of the special police unit RENEA as well as Durrës Port Authority divers to search for his body. Another question is the haste with which the Iranian MEK declared Malek Sharai a martyr [without finding a body]. Just as the President of the Republic, Ilir Meta, might decide to decorate Naim Frashëri after his death with the decoration of the Golden Eagle, the Trimestral Order. There are also similar precedents, for example, when Haxhi Lleshi awarded the late Zeliha Allmetaj with the high prize of the heroine of Socialist Work. …Albania, my homeland, a NATO member country, and a candidate for becoming a member of the EU, is failing by being labelled the “Sick man of the Adriatic”. If Madam Rajavi’s men in Manez have been murdered without trial or after a “partisan trial”, it is up to the Albanian prosecutors to open a criminal case for deliberate murder (first-degree murder). If Prime Minister Rama, in the agreement he has signed, has also given the Iranian Mojahedin MEK the right to extraterritoriality, then we are dealing not only with a violation of the law by the Prime Minister, but with national treason which under the Albanian Penal Code carries a sentence of 15 years imprisonment to life imprisonment! We hope that the Prosecutor General’s Office and the President of the Republic will pay due attention to this case, which is the question of the sovereignty of the Republic of Albania in its national territory! The above assumptions are not an Agatha Christie style fantasy. Until the body of Mojahed Malek Sharai has been found, they are quite probably a reality. It is the professional and patriotic duty of Albanian journalists, that Malek’s case is not passed over according to the ‘three-day wonder’ principle. Whether a case of extrajudicial murder, or a case of trafficking or, God forbid, a case of attempted terrorism, the consequences fall on Albania, its name, its nationals and not the Government Rama as a signatory to the mysterious agreement for transferring over 3000 Iranian MEK to Albania for humanitarian reasons.